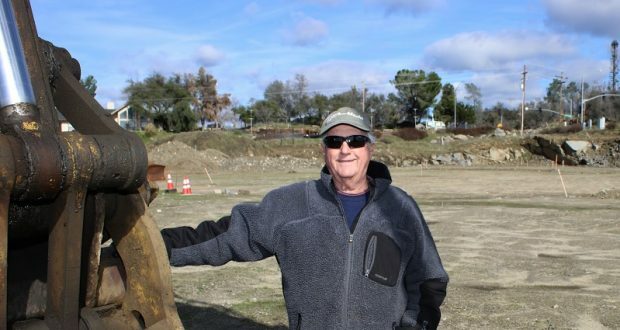 COARSEGOLD – After years of ground preparation, a long-planned business venture is about to begin at the corner of Highway 41 and Yosemite Springs Parkway. Work is set to begin next week on a service station and 3,000 square-foot convenience store, said property owner Hershel Noonkester during a site visit on Tuesday. He said that project is slated to be completed by June, but other ventures on the 23-acre site should follow. Noonkester, his wife Teddy, and their partners Dennis and Janell Jonathan of Oakhurst, have formed Yosemite Plaza L.L.C. The general contractors are B&T Service Station Contractors of Nipomo, Calif.
Their plans will bring a Sinclair service station with 12 pumps and a separate area serving diesel customers who have larger vehicles and trailers. Also planned is a 3,000 square-foot mini-mart or convenience store and a United Security Bank drive-through kiosk. The plans have been in the works for years, getting a boost in 2014 when the Madera County Board of Supervisors approved a general plan amendment and rezoning for the location. Since then, a lot of bulldozing, rock blasting and other site preparation has gone on to create an area that will accommodate fuel tanks and buildings. Access will be off a drive from Yosemite Springs Parkway and off Highway 41 for southbound traffic. Noonkester said he bought the property about 20 years ago. He expects work to start Monday with digging for the tanks and preparing footings for the canopy. Financing will come through a loan from Santa Cruz County Bank, secured by the Small Business Administration, Jonathan said in a phone interview. The partners said the service station/store part is phase one of their plans, with senior housing and other ventures to follow. “The whole concept behind Yosemite Plaza is to bring some services locally to the residents in the area,” said Jonathan. Keep checking YLP Life and yosemitelakespark.org for more coverage as the project progresses. Just what we need, another gas station & mini mart.